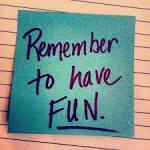 Do you find you’re not making time for FUN? I’m half way into “The Happiness Project” and again, it’s like Gretchen Rubin was writing about me! Well, I’m not sure that I feel I need more fun, but I think it can never hurt anyone’s life to have as much FUN as possible! Now here’s my thoughts and question for the week. Do you feel that if you could organize your time better and actually get a couple of things off your “to-do” list that you would enjoy the “fun” things even more? Or do we follow Gretchen’s thoughts, that by taking time to do something that truly was “fun” for us, that in turn we would feel energized and ready to tackle “the List”? But then again, does it even matter which way we lean? If we are taking the time to do something that is truly fun for us…before or after a task are we not accomplishing “more happiness”? I also think the thing I need to truly address is what is actually FUN for me. There are many times during my life that I’ve done something or gone somewhere that I would have answered, Yeah it was fun. But now more then ever I’m searching for those moments, activities and adventures that are truly “ME”. Something that brings me JOY. Makes me feel happy. These things aren’t necessarily what I would have thought of 10-5 or even 1 year ago. But I do think it’s important to re-evaluate your precious time and find something that is yours, something that may help bring the rest of your life into focus.